I love spaghetti squash. I never really paid attention to it before until a coworker had it one day and I tried it. It was sooo good. I did my research and started making recipes. Who would have thought this cantaloupe looking vegetable would make out for a spaghetti textured dish?! Spaghetti squash gets it’s name from the fact that when it’s cooked the inside pulls out of the shell in long strands resembling spaghetti. These are usually available year round as they are considered summer & winter squash. Tonight I wanted spaghetti but didn’t want the heavy pasta! Grant it I usually use whole grain noodles I still wanted to stick to my veggies for this week. According to Dr. Oz, one cup of spaghetti squash is about 42 calories and over two grams of fiber whereas one cup of white, enriched noodles is 220 calories!!!!!! Aside from the caloric factor, you know I’m a Pescatarian, but I decided the rest of the month, no fish! I just spent two weeks vacation in Florida where we ate fish daily! I need an omega break !!! 1. Preheat oven to 425. Slice spaghetti squash in 2 halves. Scrape seeds out and place face down on baking sheet. Bake for 45-60 minutes. 2. As squash are baking prepare sauce. Using medium sauce pan, heat 1 tbs olive oil. Add garlic and onion. Tenderize for 3 minutes. Add mushroom and tomato. Let simmer for 3 minutes and add marinara and seasonings. Leave on low. 3. Allow spaghetti squash to cool. Scrape inside strands out of shell into bowl. Reduce oven to 350. Add olive oil to baking dish. 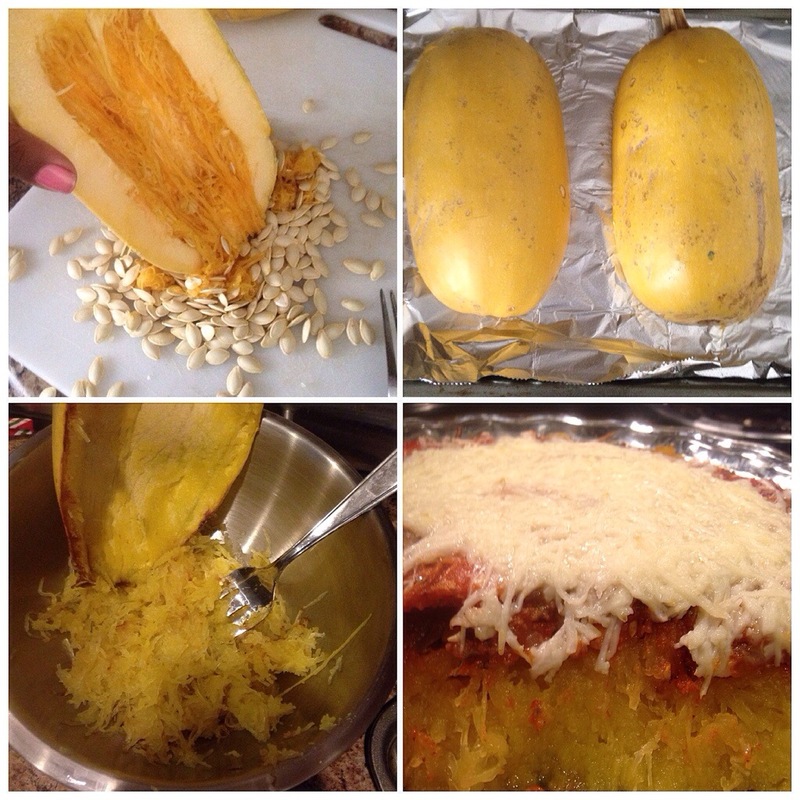 Add spaghetti squash to baking dish. 4. Remove marinara from heat and spread over spaghetti squash in baking dish. Add mozzarella to top. Bake 15 minutes or until cheese melts.